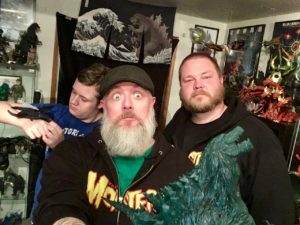 Time travel with the Kaijucast 22,0o years into the future to discuss Godzilla Monster Planet (2017). Can you believe another brand new Japanese Godzilla film is upon us?? Also can you believe that Clancy was the only soul brave enough to come over and watch the movie for the discussion? The movie’s name is Godzilla Planet of the Monsters and it’s the first official Godzilla anime – in a trilogy of course. Also, I was going to be all indignant about using “Planet of the Monsters” (which is the official English Title) instead of “Monster Planet” (which is clearly the winner of the awesome movie title contest) but it looks like I’m in the minority! Fine, I’ll concede but I’m not re-recording this episode! I really wanted to do something a little different for this Daikaiju Discussion — sort of a half-baked version of what I want these discussions to become. That includes a little less conversation and a little more in-depth look at the movie and the components that make up the film. Please let us know if you like it; that kind of feedback will definitely help shape the format. Thanks to everyone who sent in your homework – you guys rock! 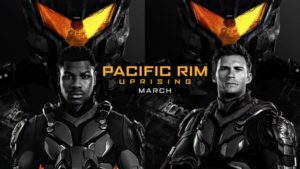 Next month we’ll be viewing and discussing the new Legendary Pictures film, Pacific Rim Uprising (2018). The movie opens on the 23rd of March, and I know the timing is tight on this –so sorry!– please make sure to see the film as soon as you can and turn in your homework by March 27th to be included in the discussion episode.